Russia still isn't convinced that hole was made accidentally. Russia is determined to figure out who, if anyone, attempted to sabotage the International Space Station (ISS). At 11 am EST on Tuesday, two cosmonauts aboard the ISS left the relative comforts of the space station for the dangerous cold of space. 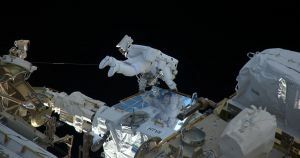 During a spacewalk expected to last six hours, they will investigate a tiny hole discovered in the side of the station’s orbital outpost this summer — a hole the head of Russia’s space agency believes could be the work of a saboteur. On August 29, ISS flight controllers in Houston and Moscow noticed a slight drop in the ISS’s air pressure. The next morning, ISS crew members discovered the two-millimeter-wide hole in the side of the Soyuz capsule and used tape to patch it. Officials initially attributed the hole to a collision with a small meteorite. Several days later, though, Dmitry Rogozin, the Director General of Roscosmos, dismissed that theory. During their livestreamed spacewalk, which is expected to end at about 5 pm EST, ISS astronauts Oleg Kononenko and Sergey Prokopyev will examine the hole for any clues as to its origin, taking photos and looking for residue. As Rogozin told Russian news agency Tass in September, getting to the bottom of this issue is a matter of “honor” for the agency, and it plans to do whatever it takes to find the person responsible. “And we will find out, without fail,” Rogozin promised. If that’s not enough to leave the culprit — if there is one — shaking in their spaceboots, we’re not sure what would be. More on the ISS hole: Someone Drilled a Hole in the ISS. Was It a Mistake or Sabotage?